With so many activities, great days out and things to do, Suffolk is the perfect choice for a family holiday. Enjoy a day with the animals at Jimmy's Farm, visit one of our many child friendly Festivals or spend a quieter day on one of Suffolk's glorious beaches on the Suffolk Coast - whatever you decide to do these Hotels offer family friendly accommodation for a great Suffolk holiday. Imagine taking the family on a break away to the beach - the kids can splash about in the sea and indulge in an ice-cream or traditional fish and chips - while Mum and Dad relax in the sun. The peaceful and unspoilt seaside town of Aldeburgh is home to The Brudenell Hotel, offering you the opportunity to make that family holiday dream a reality. The Brudenell is situated right on the beach and in the Summer months, their outside terrace offers spectacular views of the beach and ocean. There are 44 light and airy bedrooms to choose from, which can accommodate up to 3 children with cots also available. Their relaxed seafood restaurant is open all day from 7am so you can pop in for just a coffee or enjoy some fresh seafood from their delicious menu. The children's menu is also available all day. Aldeburgh makes an excellent location for a family holiday by the sea, you can explore the coast and country - either by foot or by bicycle. The RSPB Havergate Island nature reserve is close by, and there is sailing on the River Alde. If you are a music-loving family, a trip to Snape Maltings Concert hall is sure to impress, with its varying performances of both classical and new music, including the Aldeburgh Festival of Music and Arts. The welcoming Brudenell will be delighted to help you plan your break. If you're looking for a reasonably priced base from which to explore then Suffolk's many Premier Inns make an excellent choice. They are totally child friendly, with well equipped family rooms sleeping up to 4 in beds with cots also available. They offer tasty breakfasts and airy restaurants and children under 16 stay for free! 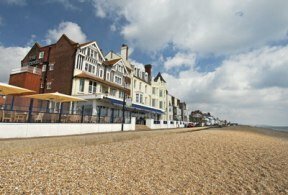 For another seaside break, try the picturesque The Anchor at Walbersick, situated a stones throw from the famous beach. The secluded village Walberswick is renowned for its Summer Crabbing competition, lovely beach with wild dunes and small tearooms. The beach is perfect for all the family, and the Anchor welcomes children and dogs so the whole bunch can enjoy a break by the sea. The Anchor has a lovely garden and terrace with rooms and cedar clad chalets with some dog friendly options and special friendly rooms. More than just a pub, they have a high class reputation locally for their top quality food. They are open all day in the summer for breakfast, lunch and dinner, and they have several events and deals on during the week including curry nights and BBQs in the summer. There is a children's menu with a great selection of food and drink for them to choose from. The Anchor is a great choice for outdoorsy families who love spending time on the beach, it also perfectly situated for exploring the coasts, towns and other delights that Suffolk has to offer. Set right on the Aldeburgh seafront, the The White Lion Hotel offers contemporary fine dining with stunning views and 38 modern, cosy and inviting bedrooms. Children are well catered for with their own menu to enjoy in the relaxed Brasserie restaurant, which serves breakfast, lunch and dinner. There are special family rooms and even better, children under 16 stay absolutely free when staying with 2 full paying adults! There are also dog friendly rooms so no one gets left behind! 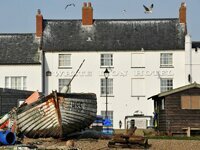 Aldeburgh is a thriving seaside town with plenty of shops to explore not to mention the fantastic beach on your doorstep. So whether it's a historic break, a trip to the countryside, or just a simple getaway for the family, there are plenty of Family Friendly Hotels in Suffolk. 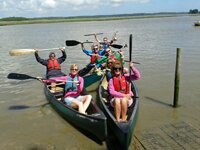 Please tell us all about your best family holiday or family day out in Suffolk by Sending Us an Email.